The Swedish furniture corporation raised its market share in Austria to 13.9%. Sales grew by 1.6% up to € 604.2m. 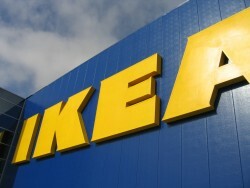 In 2011, Ikea Austria reached a new sales record. The sales figure rose by 1.6% to € 604.2m in the business year 2010/11, which ended by the end of August 2011. In the last year, the sales area remained stable. Ikea explained the prices decreased by 0,5% in the last business year after 2.0% in 2009/10. This article includes a total of 145 words.